In the tradition of Leia, Padme, and Rey comes the next awesome Star Wars female lead in Jyn Erso. Played by Felicity Jones, Jyn is recruited to infiltrate the Empire along with a band rebels including Diego Luna, Donnie Yen, Mads Mikkelsen in this stand-alone prequel to A New Hope. See the first teaser for Rogue One: A Star Wars Story below. 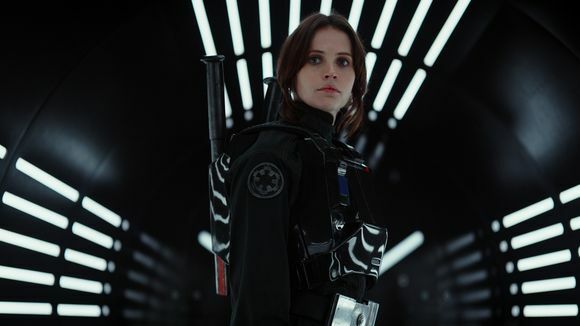 Jyn's rap sheet is reviewed before being offered the opportunity to go on a mission to retrieve the plans for the Death Star. From there it's a montage of awesomeness that'll you'll plenty to chew on until the next trailer. The construction of the Death Star, young Mon Montha, old school Stormtroopers getting wrecked by Donnie effin' Yen, Imperial Walkers, and the first look at Forest Whitaker's character who does a voice-over at the end of the teaser. Unclear so far is the use of the force in 'Rogue One' as there doesn't appear to be a jedi in sight. The tone seems a little different as the Rebels go to war with the Empire. It feels like a grand heist action-adventure with Jyn and a band of rebels. December can't come soon enough. 'Rogue One: A Star Wars Story' in theaters Dec. 16.